I have been continuing my exploration of television productions of Shakespeare’s Julius Caesar, and I am struck by the scheduling of four BBC realisations of the full play in just five years between 1959 and 1964. This contrasts strikingly with the gap of thirty-three years between the penultimate BBC presentation in 1979, which was part of The BBC Television Shakespeare, and the recent BBC Four showing of the Illuminations film developed from the current staging by the Royal Shakespeare Company. 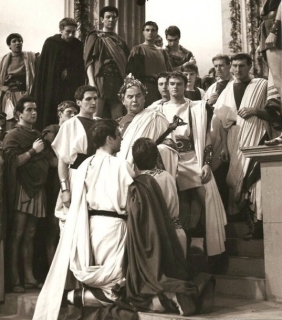 I have blogged previously about the 1959 World Theatre studio production, the 1960 version for BBC Schools produced by Ronald Eyre and the outside broadcast recording of the National Youth Theatre’s ‘teddy boy’ Julius Caesar in 1964. The fourth production was mounted in 1963 by producer Peter Dews as part of his ambitious nine-part series The Spread of the Eagle. In 1960 BBC Television attracted both critical praise and popular audiences for a fifteen episode presentation of Shakespeare’s histories, An Age of Kings. This chopped up the eight dramas from Richard II to Richard III into roughly hour-long episodes, carried the casting of key roles from play to play, and used the techniques of studio production at the time with great resourcefulness. Peter Dews was the producer, and the success of the series was such that he was given the opportunity of a follow-up with Shakespeare’s three Roman plays. Coriolanus, Julius Caesar and Antony and Cleopatra were each divided into three parts and scheduled weekly through the spring and early summer of 1963 (An Age of Kings had been shown fortnightly). Certainly the three episodes devoted to Caesar constitute an intelligent realisation as a studio production of the play. As with the 1959 World Theatre production, it is played in Roman dress, in costumes created by Elizabeth Agombar, a stalwart of the BBC wardrobe department. Unlike the earlier production, however, there is no use of film sequences, but especially in the third part, The Revenge, Peter Dews achieves a sense of scale and even grandeur. This is the most effective of the three episodes, contrasting to good effect the intimacy of the ‘tent scene’ with the battle clashes that follow. The text – which is played in a full version – divides neatly into three parts, with the first, The Colossus, closing at the end of the scene in which Caius Ligarius visits Brutus after the conspirators have left. Part two, The Fifteenth, begins with Caesar and Calpurnia and runs through the assassination to the end of the ‘proscriptions’ scene. This allows part three to open with the tent scene. Peter Dews brings only modest flourishes to the studio direction, although Caesar makes a spirited attempt to fight back against his murderers and there is a strong sense of menace in the scene of the death of Cinna the poet. During the altercation, the camera moves off the action and dollies round to show the blood-spattered base of Pompey’s statue where Caesar was assassinated. A finger traces out the word ‘Cinna’ in the blood as the credits roll. Perhaps the most striking aspect of the production is its use of lengthy developing shots on a single camera. In The Colossus, part of Act I Scene 3 is played in a shot that lasts for 7 minutes 40 seconds, with two characters close to the camera and between them an impressive use of space reaching back into the depth of the set behind. At other times, extensive parts of the text are played on just two cameras, as in the tent scene when, more than twenty minutes of drama is covered in alternating shots, with only one brief exterior of the tent on a third camera. The stand-out performance is Peter Cushing as an intense and passionate Cassius, although a youthful Brutus from Paul Eddington (later star of The Good Life and Yes, Minister) is a good match. Barry Jones achieves a scornful, arrogant Caesar, while Keith Michell is a handsome, bare-chested Antony who takes the forum scene very fast with a finely facetious manner. Michell reprised the role in the 1979 BBC Television Shakespeare production of the play directed by Herbert Wise, by which time he was far more familiar to television audiences having played the title role in The Six Wives of Henry VIII (BBC, 1970). It is interesting, too, that the British cinema industry was still sufficiently strong in 1963 for Rank to have Michell under contract and for this to need to be acknowledged in a closing title card that reads ‘Keith Michell appears by permission of The Rank Organisation’. In his edition of ‘The Alchemist’ (Penguin English Library, 1966), Michael Jamieson remarks (page 176) “In 1961 Peter Dews directed a brilliant television version from the BBC’s Midland Studios”. As one who thinks that that play and four others of Ben Jonson are as great as Shakespeare’s, I should very much like to know if this survives on film. Is there any way for a mere lay outsider to find out? Many thanks for the comment, Peter. Peter Dews did indeed direct a version of The Alchemist for BBC Birmingham in 1961 but I regret to say that the production is believed lost and there is no known copy – sorry not to have better news about this. Isobel Swan (Neighbour / Officer). Thankyou very much for letting me know these facts and the cast-list. It is a wonderful cast – which but twists the knife in the wound of the production’s loss. Had the BBC been commercially funded, almost certainly this marvellous production would have been saved on film. The makers would have needed to hawk it about the Earth to recover as much of their costs and make as many profits as possible. It takes a public-sector publicly funded operation to be extravagant with cavalier trashing of the achievement. I am Leftwing as to my desire to see everyone have a marvellous start in life; and Rightwing as to my belief in Stern Accountability. Thankyou again for this information. Thanks once again, Peter – and I share your distress at the loss of this production – and of some many others. But I would disagree about the publicly-funded nature of the BBC being one of the contributing causes of this. The commercial ITV companies were just as careless about their productions throughout the 1950s and ’60s. Television was understood very differently then, and its economics were quite distinct too – and those factors impacted both the private and public broadcasters. Who knows, perhaps this will turn up one day, as have other productions that we previously thought lost. Let’s hope so! I should be very grateful to learn about the role (if any) of foreign broadcasting corporations/companies/stations in the history of BBC and ITV drama in the ’50s, ’60’s and ’70s. (a) that the BBC and the ITV companies were not laid under contribution by foreign broadcasters – not only the USA, Canada, Australia, New Zealand and South Africa, but also all manner of other countries where English is not a first language. Even in the days (c. 1960) when there was only one TV channel in a given land, it still meant finding an awful lot of hours of entertainment and information for its viewers per week. All broadcasters in the world must have been crying aloud for each other’s usable material; which in the latter instances they could dub or subtitle. (b) that if and when the British broadcasting organisms sent a programme (e.g. a classic play) overseas, they did not post a complete new copy of the celluloid they had made, but sent the (as it were) ‘originals’. Those would have taken too long to do the circuit of the globe from country to country and perhaps got too battered in the process. (c) that each showing of a particular programme having entailed a royalty fee, payable by (say) the Belgians, the Portuguese &c, the canisters of film then went straight back to London. May those canisters and their contents not have been retained in the vaults of the Belgian or Portuguese corporations? Conceivably they would be stand-bys against rainy days in which a gap opened unexpectedly in Brussels or Lisbon scheduling; upon which a further royalty would be payable to the British broadcasters back in the United Kingdom. And if such programmes were a stand-by, after probably a couple of showings at the first, they may still be intact in some deep-buried archive? Among the DVDs in my library is – for instance – the children’s adventure series “Sir Francis Drake” of 1961/2. Admittedly it was done by Lord Grade’s ITC and therefore on film from the start; which so many TV dramas 1946-70 were not. On the other hand it is noticeable that several of the opening title sequences read not (as the majority of the 26 episodes’ do) ‘Sir Francis Drake’ but ‘Le Corsaire de la Reine’; i.e. supposably the episodes in question have been recovered from French TV? I say above ‘It is difficult to believe the following’ but of course I know nothing about it. I write this appeal as a complete lay outsider, glad of any light which can be thrown on the subject. Thanks, Peter – it’s certainly the case that there are some ‘undiscovered’ recordings or film prints of British TV drama in the vaults of foreign TV stations. In 2011 a significant number were discovered in Washington and copies were returned to the BFI. But they are often not well-catalogued, or they were discarded in the first place – shelf space and tape copies were just as valuable elsewhere as they were in the UK, and that’s a key part of the reason why so much has been lost. That said, there are researchers combing foreign libraries and we are promised news of some discoveries soon. Peter Scott – better late than never – the BBC made several copies generally on 16mm film – but they were required to return them afterwards or send them to the next customer. And while film cannot be reused, the cost of storage mean other broadcasters would sooner or later throw them out. It’s been extensively researched in depth for Doctor Who. Mr Wyver is absolutely correct to point out that this was not just the BBC; you will never see the first series of The Avengers (from ITV) again except for a few lucky escapees. Other countries have exactly the same problem, even the Germans. Thankyou so much, John, for your encouraging word about people researching copies of British TV drama in foreign TV stations; and that we are promised news of discoveries. I am very glad too that your research project has been extended to 2015. This means I can hope to continue to read further fascinating posts from you on the subject of the programmes you have studied and viewed. They are most informative and edifying. I am researching SPREAD OF THE EAGLE as part of a larger research project. You seem to have seen the episodes, by the detail of some of your descriptions. Has it been rescreened anywhere to your knowledge, the BFI, perhaps? Mike, I have viewed the series, which exists in the BBC archives in its entirety. I think the best way to see it is via the BFI Archive Viewing Service, which ought to be able to arrange research viewings for you. To the best of my knowledge the series hasn’t been shown anywhere since its first transmission. But I’m afraid I can’t help with any further details of the photograph – apologies. Follow-up question. Do you know if that photo that accompanies your blog post is from the Forum scene, or is it in the Senate. Caesar had suppliants at both. Can this be found anywhere? It sounds awesome, and Peter Cunning as Cassius? I have a mighty need. If anyone ever looked the part, it would be him. Funny coincidence how the actor who did the motion capture for Peter Cunning’s “revival” in Rogue One also played Cassius – in HBO Rome. Dangerouswaters, I think it’s Covered in the above, I think. I have been to the BFI in London myself, but I only had time to see parts 7-9, in other words “Antony and Cleopatra”. It takes some preparation, but it can be done. If you need more info let me know.